Should San Francisco adopt similar guidelines? San Francisco has a justly famous General Plan. Produced beginning in the 1970s when Allan Jacobs was Planning Director, the Urban Design Element is a particularly notable component. Many of us are familiar with its strictures--let the hilltops soar with towers, keep downtown compact, create pedestrian-friendly streetscapes, reinforce the grid pattern. Yet for all of its fine-grained recommendations, the San Francisco General Plan is more a set of policies than strictly a plan. There is no overall city-wide massing diagram, no proposed comprehensive transit network on which to hang high density development, no bird's-eye perspective of the city with towers marching westward down Market Street from downtown, similar to that made famous by Planner Ed Bacon's Market Street in Philadelphia in the 1960s. Vancouver likewise does not have an overall vision of the future city. It has instead taken a different approach to determining urban form. Rather than create an overall city diagram indicating where the tallest structures should be, they did the opposite--they mapped where the view corridors must remain open and not be blocked by views (see Figure A). Its effect is similar to Ian McHarg's famous "protection maps," whereby areas most critical to natural process are designated for open space. Except here the open areas are not stream valleys and aquifers but imaginary "view corridors" slicing through space and protecting important civic views from blockage by high-rise development by deflecting development to areas between the corridors. 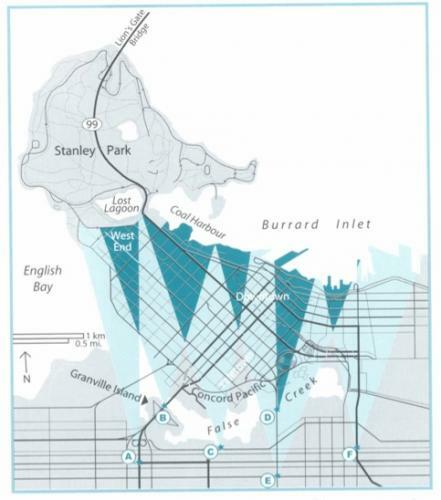 Vancouver's view corridors, protecting views of the mountain to the north, as of the year 2000. This map shows two-dimentionally the outlines of the view corridors within which views are protected. Not shown are the allowed heights, higher as one proceeds away from the apex of the cone. Thus height limits for areas within a cone are low near the apex and gradually get higher with distance. Between cones, height and floor-area ratio regulations govern. This system encourages tall, slender buildings and great variety while protecting those views held most sacred by the populace. Viewpoint C is a public park. Viewpoints A, B, C, E and F are important entry points where one first gets long-range views of the mountains. Vancouver arrived at this systematic approach in 1989 after struggling, like San Francisco often seems to be struggling, to plan the city on a case-by-case basis, in response to development applications rather than in anticipation of them. Architects were hired to survey public attitudes towards view protection, to select and evaluate prime views, and to develop implementing regulations. After considerable give-and-take in the public participation process, view corridors were adopted that now cannot be blocked by buildings. The adoption of view corridors does not preclude other more common regulations like floor-area ratios (the footprint of the building), but rather directs where on a block the tall buildings may and may not be located in order to protect pre-designated views. Interestingly, design guidelines are recognized in Vancouver not only as essential to the public enjoyment but also to ensure that new development is economically viable and marketable. Rather than considering new development a necessary evil, Vancouver recognizes that development is necessary to keep housing affordable, that density provides the means to afford public services like transit and parks and neighborhood retail, and that the quality of life for all can be increased by encouraging carefully planned new development. It is interesting to speculate where view corridors in San Francisco might be. One of the first places that comes to mind is around City Hall and the Civic Center. While the dome of city hall, at 307 feet, is one of the highest domes in the world, it could be easily "miniaturized" by surrounding it with high buildings. I can imagine a view cone centered on the dome, extending 360 degrees, increasing in height with distance from the dome. We have a series of view corridors, some accidental, some intentional. The view of the Ferry Building campanile is accentuated and dramatized by the narrow Commercial Street axis focusing on it. Had view-corridor regulations been in place in the 1960s, the ill-conceived elevated Embarcadero Freeway would never have been built. The views from the upper floors of the St. Regis Hotel and condominium project (now under construction at Third and Mission Streets) north up Montgomery Street, terminating at Coit Tower, are other dramatic and beautiful accidental view corridors. Some important view corridors throughout the city are already lost. The views down Bush and Post are now lost forever where high-rises on the south side of Market Street block views to the Bay Bridge--views that might have been left open by slight reconfiguration and relocation of the tall buildings built in the 1980s. The concept of view corridors (also called view sheds or view cones) is fundamentally different from height restrictions or floor-area ratios which we rely on in San Francisco. While those tools have their place in San Francisco city planning (as they do in Vancouver), they can be a blunt tool leading to vast districts of same-size buildings and actually obliterating views, not accentuating them. Note the sea of "refrigerator box" office buildings as you approach San Francisco via the Bay Bridge. Instead of the one-size-fits-all 30-story cap, how much better well-located soaring towers might have been. Current cries to protect views to the Bay Bridge from nearby high-rise development similarly miss the mark. What we need is more variety--well-spaced, but still slender towers, making more open space possible--not less variety. The San Francisco General Plan has long called for building heights to step down towards the water, an important concept developed to protect views for existing residents on Telegraph Hill and Russian Hill. However, these regulations make much less sense south of Market, where there are no nearby hills with close-in views to be blocked. The genesis of this step-down regulation was the construction of the Fontana Towers, view-blocking slabs at the foot of Van Ness at Bay built between 1962 and 1965. However, perhaps because of their name, Towers, the problem was misdiagnosed. These buildings offendingly block views not because they are towers, but because they are precisely the opposite of towers: slabs. The same number of apartments could have been accommodated in one or two slender high-rises, oriented to minimize view-blockage from important civic viewpoints. What the view-corridor concept has done for Vancouver is to enforce guidelines that new development will not block much-beloved views from important public places. Once agreement is reached on overall plan guidelines, individual projects can go ahead with assurance to public and developer alike, a necessary component for existing residents and for those who would invest in the city's future. Planning has replaced parcel by parcel fights, a San Francisco standard. Jim Chappell is president of SPUR.